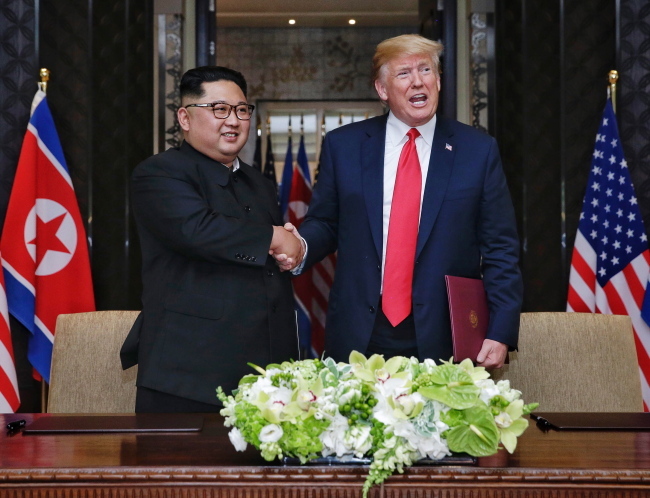 SINGAPORE -- US President Donald Trump and North Korean leader Kim Jong-un on Tuesday agreed on denuclearization and providing North Korea with a security guarantee. 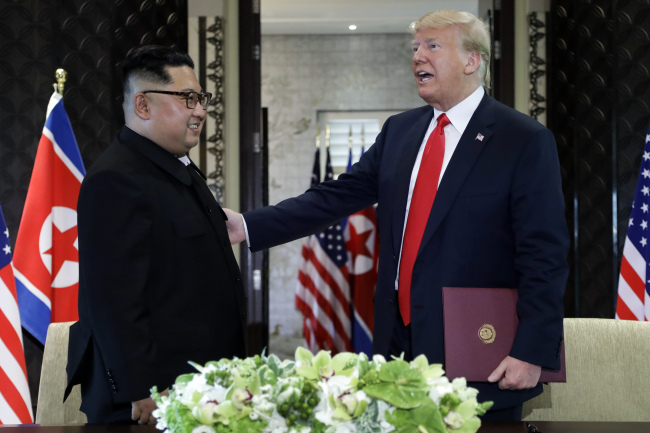 These and other agreements are stipulated in a US-North Korea agreement signed by the two, which Trump described as a “very comprehensive” and impressive document. 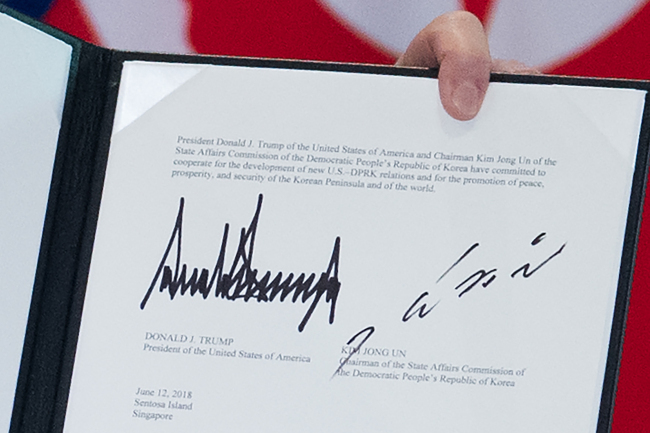 The document was signed by Trump and Kim at the Capella Hotel in Singapore, where the two sides gathered earlier in the day for the first-ever US-North Korea summit. The agreement states that Trump will provide a security guarantee for Kim, while Kim reaffirmed his commitment to denuclearization. The agreement goes on to state that the two sides will work together to establish “new US-DPRK relations” and to work together in “building lasting and stable peace” on the Korean Peninsula. DPRK stands for the official name of North Korea -- the Democratic People’s Republic of Korea. The agreement also stated that North Korea will uphold the April 27 Panmunjeom Declaration and commit to complete denuclearization. The Panmunjeom Declaration was signed at the inter-Korean summit on the border, and calls for denuclearization of the peninsula and improved relations. The US and North Korea also agreed to cooperate in repatriating prisoners of war, and those missing in action from the 1950-53 Korean War. “A lot of goodwill went into this, a lot of work, a lot of preparation. We’re very proud of what took place today,” Trump said. As for Kim, he said that the summit was a historic moment. “The world is likely to see an important change,” Kim said, adding that the meeting and the document mark “a new beginning.” He went on to thank Trump for making the meeting possible. Speaking to reporters after the working lunch, Trump said that their meeting had gone better than expected and that “fantastic progress” has been made. In Seoul, President Moon Jae-in expressed hopes for the success of the US-North Korea summit, saying that he had a sleepless night in anticipation of the meeting. “The North-US summit has started. Perhaps the minds of our people are on Singapore. I too spent a sleepless night,” Moon said at Tuesday’s Cabinet meeting. The weekly meeting started with the president and top government officials watching live coverage of the summit in Singapore. “(I) together with the people (of South Korea) ardently hope for a successful meeting that brings us complete denuclearization and peace, and opens a new era for the South, the North and the US,” Moon said. Moon will be briefed on the meeting by US Secretary of State Mike Pompeo on Thursday in Seoul. Pompeo is set to arrive in Seoul on Wednesday.